A recreation of the Çatalhöyük 'volcano' and street-map mural. 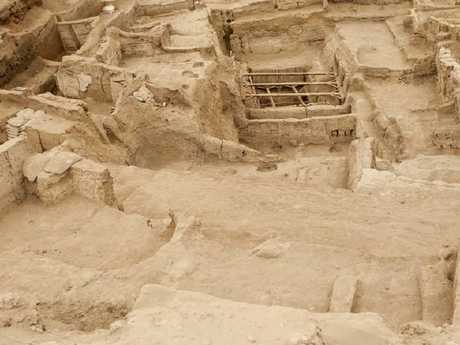 Çatalhöyük is one of the world's oldest known towns. It's a whole hill of mud, stone and timber constructions in central Turkey, built by hunter-gatherers some 9500 years ago. Occupied for some 2000 years, the layers of history archaeologists have uncovered reveal the impact of the discovery and development of agriculture and the domestication of animals on human society. What makes Çatalhöyük so significant, however, is its preserved depictions of stone age art. Thousands of figurines have been found. Some show seated women. Most are of animals. But a few uncovered rooms held fragments of something extraordinary. Murals and reliefs on their walls. They are seen as some of the earliest examples of religion. Men with erections. Headless figures. Extinct aurochs (a variety of large cow). Lions. Vultures. 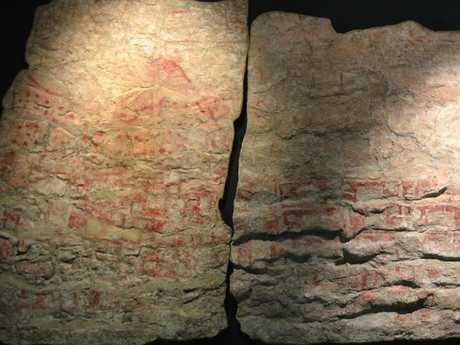 One red-ochre mural has controversially been interpreted as being the world's oldest landscape painting - a volcanic eruption - behind what could be the world's oldest street plan - Çatalhöyük itself. But much of what Çatalhöyük has taught us about stone age culture is now in doubt. The British archaeologist who won international fame for discovering the site is being accused of forging some of his key finds. Som eof the ruins excavated at Çatalhöyük Konya, in Turkey. It was first built in 7500 BC. James Mellaart discovered Çatalhöyük in 1961s. He died in 2012, aged 86. Mellaart wanted fellow archaeologists and historians to publish his remaining discoveries after his death. So he gave them access to his work. Some of these documents were handed to the Luwian Studies organisation last year. They wanted to double check a few things. They wanted to see his original notes. Sketches. Photographs. Instead, they made many disturbing finds. 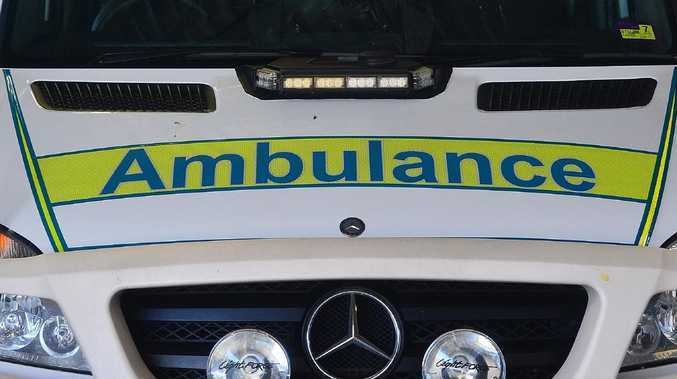 One of the researchers given this job has told LiveScience he now feels "betrayed". "I feel abused," geoarchaeologist Eberhard Zangger says. "He (Mellaart) had no scruples when it came to harming other people's careers." Alarm bells began to ring over an inscription Mellart claimed to have found at a much younger Turkish archaeological site called Beykoy. It supposedly told the tale of a Trojan hero called Muksus. It was supposed to be 3200 years old. Mellaart first mentioned the inscription as far back as 1992. But he always maintained he could not read the ancient language - Luwian - it was written in. So he left it for others to do after his death. But, amid the bundled papers stacked in Mellaart's apartment, Zangger found clear evidence that Mellaart fully understood how to read and write that language. And he had even left 'drafts' of the Muksus tale laying around. How much of the legend - if any - is original is now unknown. But also in the apartment were some disturbing objects. And they clearly had ties to Mellaart's most significant discovery. 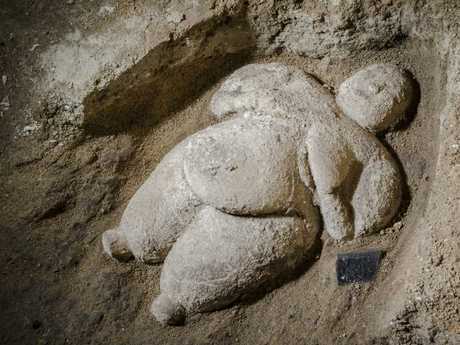 One of the many female figurines unearthed at Çatalhöyük. Mellaart had been caught up in scandal before. Shortly after starting excavations at Çatalhöyük, painted pots in the archaeological site's distinctive style started appearing in antiquities markets. Museums started buying them for thousands of dollars - until one was found to be a modern forgery. And then he claimed to have asked a woman he met on a train where she had found the beautiful bracelet she was wearing. She purportedly led him to an illicit hoard of bronze-age treasure, and let Mellaart's spend several days there to take notes. Much later he published his findings. He was immediately accused of aiding and abetting smugglers - though no trace of the treasure was ever found. And while no evidence ever linked Mellaart's to the forgeries or looters, he was expelled from Turkey. But Mellaart managed to keep his reputation largely intact. Now, it's likely to take a long time to unweave his tales. Much of his research is real. Çatalhöyük is there. Its magnificence - and mystery - is in plain view. Many other archaeologists have worked at the site since Mellaart was evicted in 1965. But some of his key original findings were published in reputed archaeological journals, and therefore used as the basis of much interpretation and speculation. This is now in doubt. 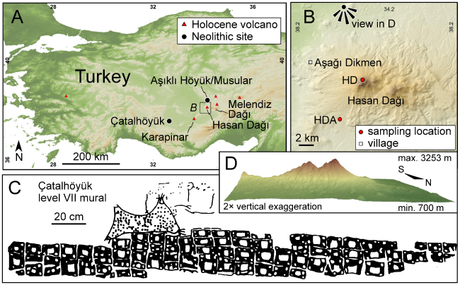 The faint preserved remains of what some believe to be an exploding volcano and street map of Çatalhöyük. But is it a leopard skin and geometric pattern? Mellaart's London apartment was piled full of examples of his research skills - and fertile imagination. Amid the mountains of documents and legitimate literature were found discouraging clues. 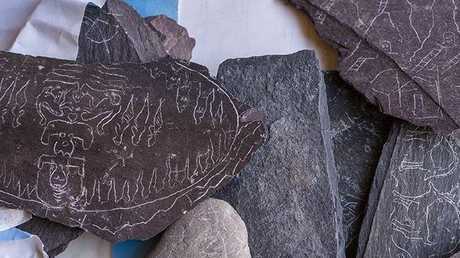 "Mellaart's study contained more evidence of forgery, including slates with scratched sketches of murals that he had allegedly seen in Çatalhöyük," Luwian Studies writes. Were these templates for forgeries? Or innocent attempts at re-creation? They showed animals and designs similar to some found at the prehistoric archaeological site. One of Çatalhöyük's most famous artefacts is the 'volcano exploding' mural. Mellaart described this scene in the 1960s as a volcano with twin peaks, similar to one 130km from Çatalhöyük. This volcano, Hasan Dağ, is known to have erupted about 9000 years ago from geological evidence. An eruption has long been believed to have been the inspiration behind the 'ancient' mural. Beneath the 'volcano' image is what appears to be a birds-eye view of Çatalhöyük's tightly-packed houses. It now features is most textbooks about maps and cartography. It's often declared to be the oldest depiction of a volcano, and the oldest street plan. There are other interpretations, however, The "volcano" may be an image of a leopard skin. 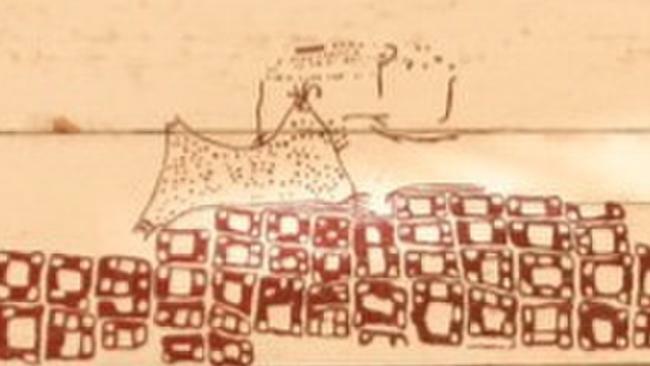 Other images found at Çatalhöyük's are clearly leopard skins and use a similar outline and dotty composition to the supposed 'volcano'. The "street map" may simply be a geometric design. Does this contradictory interpretation vouch for its authenticity? Or did Mellaart modify his sketches to suit his own ideas? Now that Mellaart's 'inscription' reciting a Trojan tale has been found to be faked, doubt must fall on much of his work. "Mellaart would fabricate drawings of artefacts and translations of alleged documents to reinforce his theories," Zangger told LiveScience.